Francoeur's Sonata IV in E Major has been transcribed for cello and piano by Nada Radulovich, a dynamic musician who has performed extensively throughout the world. Ms. Radulovich is originally from the Midwestern United States, but completed college studies at Smith College, Manhattan School of Music and the Peabody Institute, in addition to being certified in the Suzuki teaching method. She mentors young musicians through a private studio and performs at a number of concerts and festivals each year. The Sonata in E for violin was written by Louis Francoeur in 1726 and published in his Second book of Sonatas dedicated to Mme. de Charolois. In 1863, it was republished by Jean Delphin Alard, who mistakenly attributed the sonata to Louis' more accomplished brother, Francois, in his collection, "Classic Masters of the Violin". A generation later, in 1924, Arnold Trowell transcribed this sonata for cello. His publication was freely altered and highly edited, which was common practice in that time. Trowell deleted the entire "Corrent' and replaced it with his own composition, an 'Allegro Vivo', very much in the classical style. A fellow named Martin Griffiths found the admission in his diary for 1956…"(I imagine that he was by this time embarrassed about the fact and could not admit it publicly). This transcription honors the original manuscript by Louis Francoeur, including the Corrent deleted by Trowell. 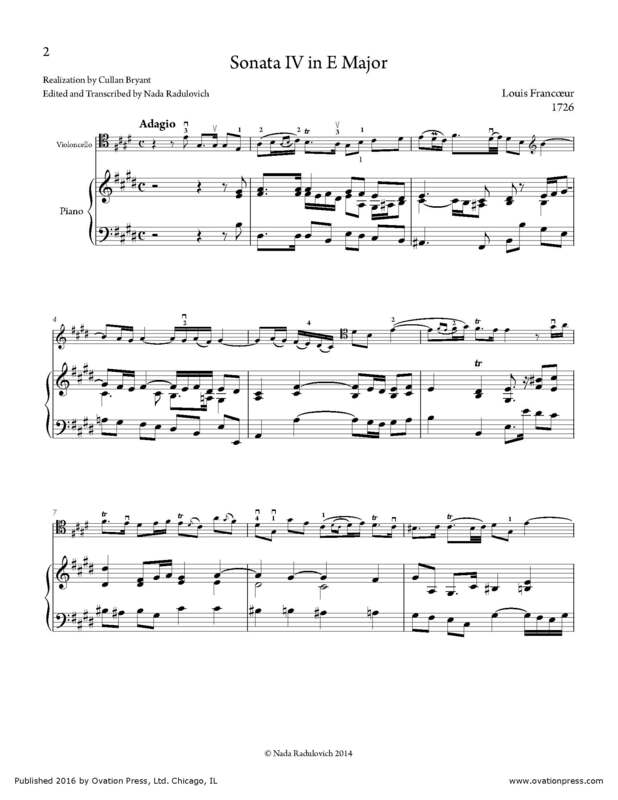 Download and print the score today to gain access to this expertly edited arrangement of Francoeur's Sonata IV in E Major for cello and piano by Nada Radulovich!